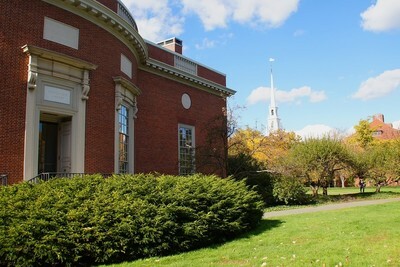 Harvard University offers online education in many subject areas. The leading U.S. institution lets learners from around the world study with free courses. Harvard is the world's most famous university and is part of the prestigious Ivy League group. Several U.S. presidents and CEOs of companies like Facebook and Goldman Sachs are Harvard alumni. There are only about 20,000 students enrolled on campus at any time. However, with the help of online courses (MOOCs), more than 6 million learners around the world are enabled to participate in high quality education. How Does a Harvard MOOC Work? Harvard was a founding member of the edX course platform in 2012 (together with MIT) with the goal to make higher education content accessible worldwide. The courses are open, there are no access restrictions. Everything is 100% online. A typical MOOC has thousands of participants at the same time. The content is provided via video lessons. Exams are offered online via quizzes and tests. Questions can be asked in discussion forums. A course lasts around 4-6 weeks and requires about 3-5 hours of work per week. The course language is English, some lessons offer subtitles in other languages. By far the best-known Harvard MOOC is CS50: Introduction to Computer Science. The course provides a comprehensive introduction to computer science, programming and web development based on the on-campus course for undergraduate students. More than one million learners have already enrolled in the online version, and the lecturer (Professor David Malan) enjoys cult status among his students worldwide. Also well-known is a course on moral philosophy (Justice). This MOOC has also had hundreds of thousands of online students so far. Further courses are offered in various subjects: From architecture to biochemistry, Chinese history, and world literature. Around 100 courses are available via edX (list of Harvard courses). Many of the courses are in computer science as well as in humanities and social sciences. Access to the learning material is free of charge. This is also true if the first course run is already completed and the MOOC is archived. If you are only looking to learn for free, you should choose the audit option when signing up. If you want to complete your course with a certificate, choose the Verified Certificate option. This usually costs around $50 per course. In addition, there are more extensive paid course series that conclude with a Professional Certificate. For example, the course series on Data Science includes 9 individual MOOCs over several months and costs $400-500 to complete. Get A Harvard Certificate for Your Resume? The certificate is issued under the HarvardX brand, as shown above. Certificates can be integrated into your LinkedIn profile and can thus directly be verified by third parties. 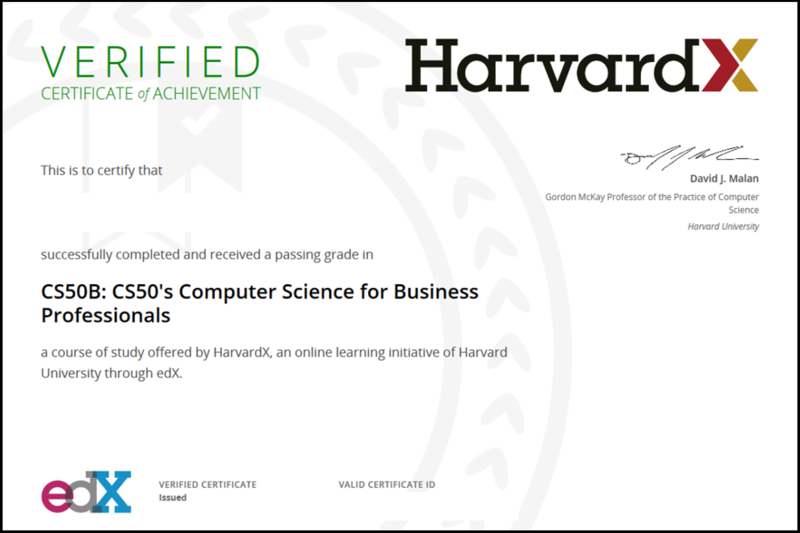 When applying for a job, the HarvardX certificates show your skills and your committment to education. This is a positive signal towards potential employers ("Are The Certificates Worth It?"). Please note: MOOCs usually do not offer academic degrees. Verified Certificates can be seen as evidence of individual educational efforts. A dedicated online learning portal in the field of adult education, mainly on education-related topics. This includes Executive Education courses which can cost several hundred dollars. Harvard Business School's online portal (HBX). HBX offers management courses, which are usually priced above $1,000 / course. Note: In addition to asynchronous courses for self-learning, they also offer virtual live classrooms. How exactly the various online learning initiatives will differ from each other in the future is the subject of current debate. An interesting experiment regarding 3D Virtual Reality lectures shows that Harvard does not shy away from further e-learning innovations. With a total of around 6 million learners, Harvard MOOCs offer attractive educational opportunities for users worldwide. Around two thirds of learners come from countries outside the U.S.. The online format easily overcomes any geographical distance. Their courses are suitable for many learners: For current students, for professional training or for private education. Also, since many of the courses can be taken free of charge, barriers to learning are low. Another key advantage: In contrast to some other online programs, Harvard makes sure that their courses meet their high quality standards. If you can't find the right course from Harvard, there are various other high-quality universities from around the world (Stanford, Oxford, HEC Paris, and others) that also offer MOOCs. Discover them with our search portal. You can search 8,000+ MOOCs and other online courses from more than 50 providers and 22 subject areas in our directory. Are you interested in online learning? Subscribe to our newsletter here. And follow us on Facebook and Twitter now!